This work was a newspaper serial published while Kierkegaard was a student. It is a review of the novel Only a Fiddler (Kun en Spillemand, 1837), by Hans Christian Andersen, 1805-1875, a Danish writer of fairy tales, poet, novelist, and dramatist. 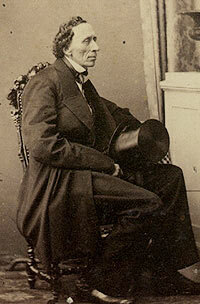 Kierkegaard writes that Andersen "completely lacks any philosophy of life". Kierkegaard also criticized Andersen's statement that "Genius is an egg that needs warmth for the fertilization of good fortune; otherwise it becomes a wind-egg." Even in this early work one can see Kierkegaard's emphasis on the individual and the rejection of Romantic ideology, so much a part of nineteenth century thought. He counters the belief that environment determines genius. According to Kierkegaard, each person needs an idea for which he might live. [A life-view] is more than a compendium or a sum of positions, maintained in its abstract impersonality; it is more than experience, which is as such always atomistic; it is in fact the transubstantiation of experience, it is an unshakable sureness in oneself, won from all experience.... If we are asked how such a view of life comes to be acquired, we answer that for him who does not allow his life to fritter away completely, but seeks as far as possible to turns its individual expression inwards again, there must of necessity come a moment in which a strange illumination spreads over life—without his needing in even remotest manner to understand all particulars—for the subsequent understanding of which he now has the key; there must, I say, come a moment when, as Daub [a theological writer] observes, life is understood backwards through the idea (p. 77f.). The work's importance—an old joke has it that only Kierkegaard and Andersen read the book—lies less in the critique of Andersen's novel than in its presentation, in tentative but recognizable form, of Kierkegaard's theory of the individual, or rather, of his characteristically passionate advocacy of a particular brand of individualism, here advanced in part through a rejection of the explicit romantic sentimentality and implicit social determinism of Andersen's plea for the self-pitying genius, but also, less obviously, of the very Hegelianism upon which Kierkegaard appears to draw for his critique of Andersen's romanticism. Though Kierkegaard would later write that rereading Andersen's fairy tales was like taking a "rejuvenating bath," he had no such sympathy for this novel of an aspiring violinist defeated by circumstance. Kierkegaard's basic complaint is that Andersen has projected himself into his work, and moreover, that this self hardly deserves the name. "First and foremost the poet must win for himself a competent personality," Kierkegaard writes, "and this (so to speak) dead and transfigured personality it is that must and can produce, not the many-sided, worldly, palpable one." In this we can hear the obvious influence of Hegel's criticism of Romanticism and the romantic artist, to which Kierkegaard had already been exposed in Johan Ludvig Heiberg's Hegelian lectures on aesthetics at the University of Copenhagen—it was in fact Heiberg who suggested to Kierkegaard the idea of a book about Andersen, although he rejected the finished book upon which Kierkegaard published it himself. But the notion of a dead and transfigured self as the source of creativity sheds light on Kierkegaard's title, and points back to his neither strictly romantic nor Hegelian notion of the achievement of a competent personality through a Lebensanschauung or "life-view [that] is more than a gathering-up of a sum of propositions, and more than mere experience,...the very transubstantiation of experience" and "an unshakable confidence in oneself which has been won in the teeth of the merely empirical." Andersen's portrait of the self-pitying genius must have hit close to home for Kierkegaard, who during this period imagined himself not so much as a poet or artist but as one burdened with a poetic, aesthetic, melancholy disposition, overly-imaginative, enthralled by the possible, doomed to what he would later call a life of "glittering inactivity", isolation, and even early death by his father's gloomy, emotional pietism and the sense of inherited sin he imparted to his children—a fate Kierkegaard could control no more than Andersen's violinist could his. Commentators have thus linked Kierkegaard's criticism of Andersen to his self-criticism in the famous Gilleleje journal entry, where he laments his lack of "the idea for which I can live and die." And in The Point of View for my Works as an Author, Kierkegaard described his spiritual condition at the time as one of "extraordinary possibility, the significance and the definition of which I did not myself understand...I had not lived...Man I had not been." The year leading up to the publication of the present work, however, was decisive enough that he should feel resurrected or initiated into manhood: within the span of a few months, he experienced a reconciliation with his father and thus with God, witnessed a transformation of his melancholy in a conversion experience of "indescribable joy," and, with the passing of his father, recommitted himself both to his theological degree and to an ethical and religious life. 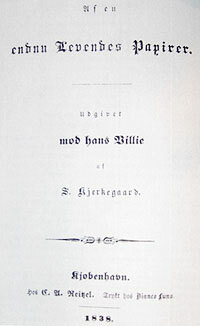 After such experiences, Andersen, a member of the boarding-house literary clique with whom Kierkegaard had even lived for a time and whom Lowrie memorably describes as a sentimental "defenseless giant" often victimized by Kierkegaard's wit, must have appeared as a ghostly reminder of the aesthetic life, the life of being "only a fiddler," which he was now committed to overcoming in himself. Andersen was hurt by this critique, but the two later came to terms. Kierkegaard sent him a copy of the second edition of Either/Or (1849), for which Andersen thanked him saying, "You have given me really great pleasure by sending me your Either/Or. I was, as you can well understand, quite surprised; I had no idea at all that you entertained friendly thoughts of me, and yet I now find it to be so. God bless you for it! Thank you, thank you!" Since earliest childhood an arrow of grief has been buried in my heart. As long as it stays there I am ironic—if it is drawn out, I'll die (Journals, VII 1 A 205) .